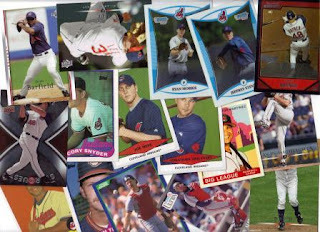 Indians Baseball Cards: Thome, Dinged Corners, and did I just get tricked!? Thome, Dinged Corners, and did I just get tricked!? One of the Zenith 5x7 'cards-in-a-card' I pulled some time ago was a Mark Grace card. Well, fellow blogger, also named Mark, asked if he could trade for it, so I gladly sent it to him. In all fairness, Mark provided me a list of Thome cards he has, and I was too slow in getting my "stuff" in gear to pick cards off the list. So, he picked out three nice ones in exchange for the Grace. 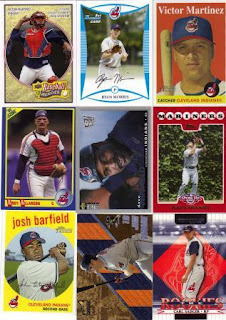 We've got a '93 Donruss, a 1997 Score Hobby Reserve "Goin' Yard" and a 1997 Pinnacle Inside! Thanks a bunch!! Once I get my trick-or-treatin' done, I'll be putting together some trades, and from the looks of it, Mark's got quite a stash of Thome sittin in Chi-town! I also received a nice package of cards from Patricia! There was also a very sincere letter. :-) When I started "Tribecards," I never set out to touch people the way I apparently have, and it is honestly quite humbling to read some of the posts and letters I get. I thank you, all of you, from the bottom of my heart! Patricia and the girls sent me quite a collection of Tribe cards!